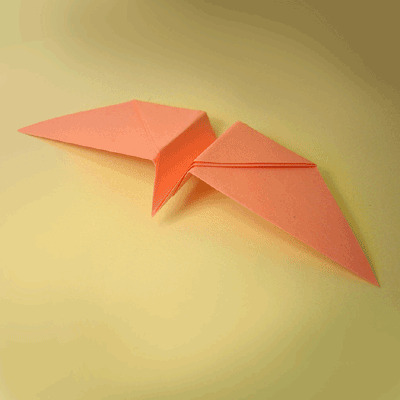 The origami twirling bird is one of the easiest models to make, but its also so much fun! Try using different types of paper to see which one will twirl the best. For a printable Pdf of the twirling bird instructions, click here. 1. Start with your paper white side up. 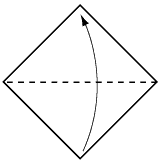 Fold in half, as shown. 2. Fold in half again, crease and open. 3. Now fold top of model down past the baseline of the model. 5. Rotate model so it is now standing up. 6. Fold down the top flap along the line shown. Then repeat the same thing on the flap behind. 8. Twirling bird is complete! To make the Twirling Bird fly, throw it like a paper plane. It will tumble in circles!